On a recent trip to Tignes in France, I discovered that my trusty Marin East Peak based skibike wouldn't be allowed to use any of the chairlifts, which called for a drastic solution. A brief phone call to Serge at Firem VS, the friendly local French skibike manufacturer, resulted in an unlikely opportunity. Being handed a £1200 "VS Evolution" skibike to take out on test for the duration of a holiday was really unexpected. The Firem VS flies in the face of convention with a frame made from a single sheet of aluminium, the makers claim that this allows a degree of flex that tubular frames don't give and enhances the riding experience. The frame is tall, by any standards, the sitting position feels very high and you find yourself riding eye to eye with skiers. The saddle looks like the type fitted to "comfort" bikes, fairly wide and squashy, not the sort you would associate with a sporty ride, in practice it works really well and four hectic days in the saddle caused no discomfort. There is no saddle adjustment though, if you're around 6 foot tall this should be fine, women or smaller men might have to consider the kids model. The skibase seems quite long, the Firem VS takes up a lot of seats on the chairlift and can be awkward to fit into small gondola type telecabins. But the upside of the length is a chassis that is stable and assured. The suspension has the ability to absorb large bumps with complete aplomb; if you have the balls you can ignore all that tiresome turning and head straight down the fall line and trust the VS to iron out the topography for you. This skibike keeps reminding me that it is so much better than I am. If given the chance, it accelerates so quickly that you can be taken by surprise, fortunately it has a unique and efficient braking system. I was reluctant to use it all the time, feeling that it was "cheating", however, whilst following a narrow off-piste traverse, I suddenly found my path blocked by a mother and screaming child. A quick dab on the brakes stopped me in my tracks and saved me from having to head over the rocks to avoid hitting them. I also ran some test to see how much the mar the piste when the snow is very soft, the results were impressive and no worse than a snowboard carve. The skis fitted are relatively short and very flexible, this works well for following bumpy terrain, but on a couple of occasions I noticed a tendency for the front ski to "wash out" possibly due to excessive flex. Accurate steering, plush suspension, indomitable construction, effective brakes, a plethora of high tech precision components. The weight, a 15kg skibike is hard work getting through the turnstiles and getting on/off chairlifts. The length, sitting on a chairlift takes up 4 places, small chairlifts, gondolas, etc. could be an issue. Limited seating adjustments. Bulky and slippery foot pegs. The relatively high retail price. Firem are getting close to making a highly desirable product. 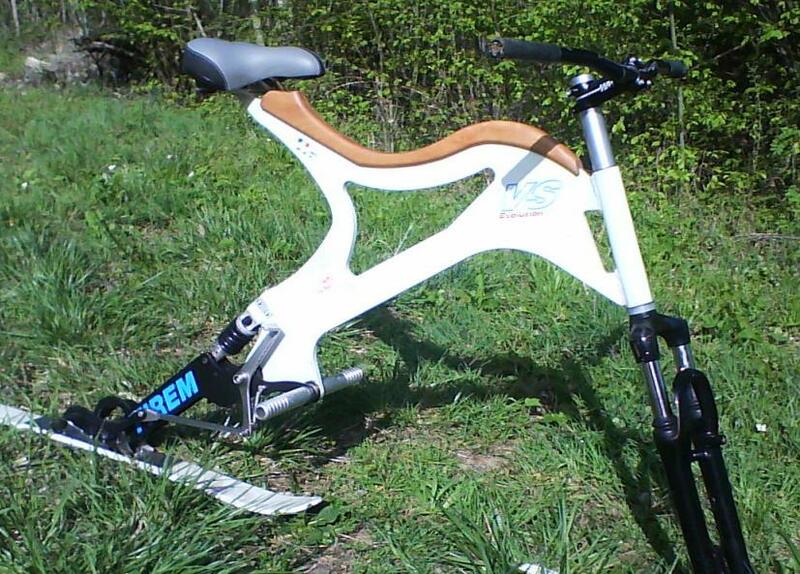 They need to focus on reducing the weight and size of their skibikes without compromising the ride or handling. They also need to reduce costs and create a product that sells at a competitive price without abandoning quality and durability. It is a tough balancing act, but all manufacturers makers must face similar challenges. According to the French SkiBike Club http://www.veloski.org/ it is possible to skibike at Les Arcs and there is a "Attestation" certificate free to download to proove this. It is always prudent to mail a resort for confirmation before booking your flights and accomodation, etc. as rules can change from season to season. I haven't tried the Geary skibikes yet and you are unlikely to find a hire outlet in France yet. The Firem French made skibikes are very similar to the American designs from Geary, Koski and Lenz and I am sure that they would be keen to discuss hire arrangements directly with you. There are also likely to be outlets where you can rent "Le SnowScoot" or a Brenter skibob skibike, although they might not be quite the flavour of skibike you are looking for. I am aiming to be in France in January 2012 too and should be doing some more promotional work with Firem, we may get to meet up yet! Thanks for the kind comments about the Skibiker SkiBike blog, it makes all the effort worthwhile. ***Thanks Mark*** for all the info .. as long as 2012 winter obliges and gives us what we're looking for it may be an excellent season!